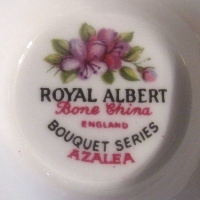 Vintage Royal Albert Azalea Teacup and Saucer - Bouquet Series! 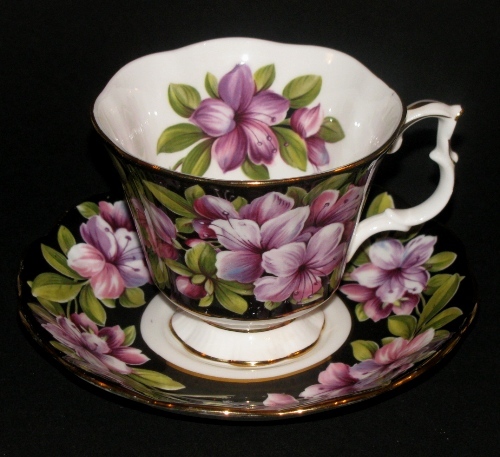 GORGEOUS Royal Albert Azalea Teacup and Saucer. One of the Bouquet Series, which includes Azalea, Anemone, Carnation, Crimson Glory, Hydrangea and Rose of Sharon. 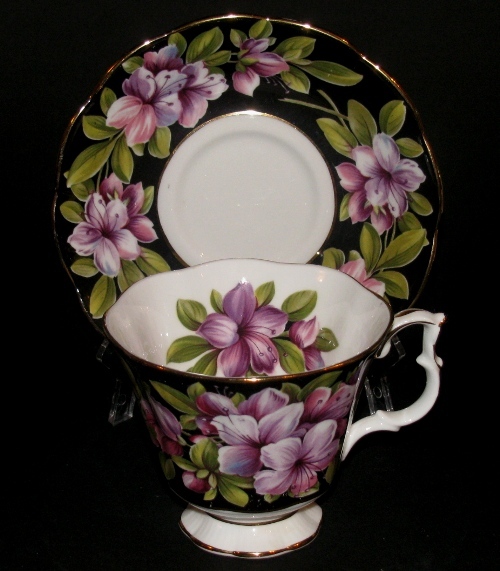 In chintz style, with luscious purple flowers and gold trim. Teacup shape is Gainsborough, saucer shape is Hampton. Series est. between 1970s and 1980s. Some white fleabites on the black background, may have been part of manufacturing. Teacup measures 3 inches high and 3 1/2 inches across. Saucer measures 5 1/2 inches across.